Tackling deforestation and other climate mitigation actions will be one of the key items on the agenda of the up-coming Conference of the Parties to the UN Framework Convention on Climate Change in December in Lima, Peru (COP20). This has been evidenced in the recent past with the intense negotiations on REDD+ and more recently with the launch of the New York Declaration on Forests, signed by governments, companies and NGOs on the occasion of the UN Climate Summit held in New York September. REDD+, climate smart agriculture, sustainable supply-chains are now bundled together in a common effort to reduce deforestation and related carbon emissions in tropical areas. However, lack of compliance with internationally agreed safeguards, poor governance reform, and the increasing pressure on indigenous lands and territories require more compelling action to address the danger of exacerbating human rights abuse. Voluntary agreements and private public partnerships cannot substitute for robust public international and national action to target internal and external drivers of deforestation, ensure respect and compliance with international human rights standards and norms and in particular respect for and protection of indigenous peoples’ lands, territories and resources and the principle of free prior and informed consent. Accountability of governments and companies is even more urgent given the risk that current negotiations leading to COP21 in Paris may pay only lip service to indigenous peoples’ rights and the obligation to ensure a rights-based approach to land-based mitigation, as well as the risk that they will fail to duly recognise the positive contribution of indigenous peoples in forest protection, climate mitigation and adaptation. For all these reasons, the Forest Peoples Programme (FPP) is organising – together with Peruvian Indigenous peoples’ organization AIDESEP – an international public hearing on deforestation and human rights during COP20. 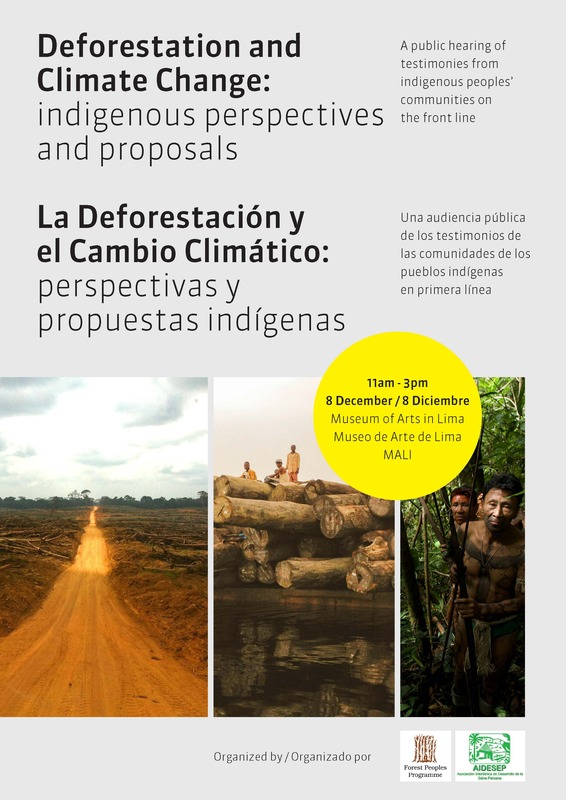 The public hearing will be held on December 8th at the Museum of Arts of Lima (MALI). Special guest of the hearing will be Victoria Tauli-Corpuz, UN Special Rapporteur on the Rights of Indigenous Peoples. The hearing will offer a public space for indigenous peoples leaders from Latin America, Africa and Asia to share their experiences from the field, both experiences with deforestation and associated human rights issues, and experiences in defending forests and resources. The hearing will also launch a groundbreaking report on deforestation, with contributing authors and involved communities present, and the demands of the Palangka Raya Declaration will be reiterated. In addition to the hearing, that is meant to be a contribution to the activities of the Cumbre de los Pueblos, FPP and a delegation of indigenous peoples’ leaders and CSO representatives from Peru, Colombia, Guyana, Panama, Paraguay, Democratic Republic of Congo, Indonesia will also participate in the activities of the Indigenous Pavilion and at civil society initiatives at the Global Landscapes Forum. To pre-register, please email COP20hearing@forestpeoples.org to reserve your space to come and exchange experiences and listen to community testimonies.